For pedals with higher voltage requirements, use this voltage doubling adapter with a 2.1mm jack to combine two Pedal Power outputs to make 18V or 24V. 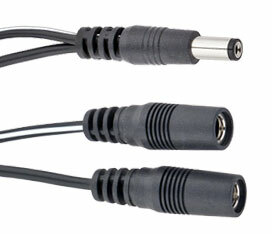 Ideal for MXR Flanger and Dime Distortion, Crybaby 535Q, various Fulltone and Keeley products.This adapter will accept any cable with a 2.1mm plug. For pedals with higher power requirements, the Current Doubler Adapter combines the current of two outputs to power a single pedal. It is most commonly used in combining outputs 5 & 6 on a Pedal Power 2 PLUS to create a single 9V 500mA output. This adapter features two BLACK 2.1mm barrel plugs to a single GREEN 2.1mm jack for use with any standard power cable with a 2.1mm plug. Please note that this adapter will not combine the voltages of the original outputs. Only the current supply will be combined. The Output Splitter Adapter allows two pedals to share a single Pedal Power output. 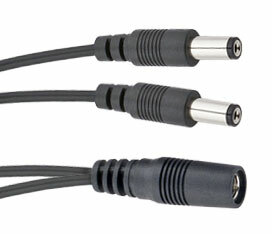 This splitter features a single BLACK 2.1mm barrel plug to two BLACK 2.1mm jacks which connect to any standard power cable with a 2.1mm plug. The white striped side of the splitter cable is ground lifted to eliminate ground loops. Please note that this splitter will not alter or split the voltage of the original output -- example, one 9V out splits into two 9V outs; one 12V out splits into two 12V outs.